Play HISTORY MAKER BASEBALL With Ordinary Baseball Trading Cards! 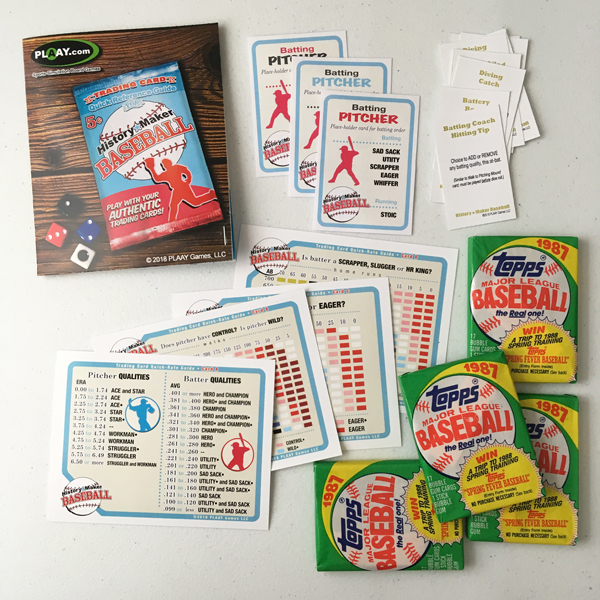 Cardstock Heroes: Your Trading Card Quick-Rate package includes everything you need to play HISTORY MAKER BASEBALL with your own baseball trading cards! As most know, HISTORY MAKER BASEBALL Big League Baseball Game was designed to be played with ordinary baseball cards. While time and experience has shown that many in the sports game hobby crowd prefer playing HMB with our pre-rated card sets, our sense/hope is that there's still some space in the board game community for a realistic baseball game that uses ordinary trading cards. To help make this happen, we've created a Trading Card Quick-Rate Package for HMB. It was a big hit at PLAAY-Dot-CON 2018, and it's NOW AVAILABLE for YOU to enjoy! Read about the PLAAY-Dot-CON 2018 Trading Card Tournament with HISTORY MAKER BASEBALL! Playing HMB with trading cards is more about enjoying the game of baseball on an anecdotal level: each colorful piece of card stock represents a small slice of baseball history, a snapshot of a specific moment in a player's career, frozen in time. It's an immersive experience: you'll learn about players you never knew. You'll learn new things about players you know well. You'll experience each player face-to-face, often in rich biographical detail. And, you'll see them perform on your tabletop with new context that we think you'll find to be very satisfying. To play the game with trading cards, you use the standard HMB game materials: game book, game boards, dice. There are no changes to the game rules. Trading card games use the same basic game rules as "classic" HMB regarding strategy choices, infield positioning, pinch hitting, relief pitching, pitcher FRESH-ness and so on. You'll read the results from the game book exactly the same way as the standard game. The ONLY difference is that your game action will be generated from the statistics on the back of your trading cards. You'll use the Quick-Rate cards to translate those statistics into HMB's "game language" of STARS, SLUGGERS, WHIFFERS, ICONS and so on. For "trading card baseball," we recommend that players be rated based on their most RECENT single season MAJOR league statistics printed on the back of the baseball card. Usually, these statistics will be listed as the next-to-last line of numbers, with the bottom line typically presenting the player's career major league totals. When the game book calls for a specific quality, simply locate the card which translates that quality, and cross-reference the appropriate statistics to determine whether the player has the quality or not. For example, you roll a 1-2-4 and the HMB game book asks you if the pitcher has CONTROL. Your trading card indicates that the pitcher allowed 56 walks in 144 innings pitched in his most recent big league season. Referencing the appropriate Quick-Rate card, you'll choose the columns that are closest to these figures. In this case, that's 50 walks in 150 innings pitched, which cross-references to a coral-colored quality code. Checking the code key at the bottom of the card, we see that the pitcher has SEMI-CONTROL—so we'd have to roll the decider die to determine the outcome! Game play continues normally, with checks as needed. Many dice roll results won't require a quick-rate look-up (i.e., "Is pitcher FRESH?," "Is batter HOT?," "SAME?" and so on), while others are obvious enough so as not to need one (for example, when the game book asks if Mickey Mantle is a SCRAPPER, or Max Scherzer is WILD). After a couple times through the batting orders, you'll begin to get familiar with each player's profile, and game play will speed up considerably. There are special rules for trading cards that perhaps don't include some of the necessary numbers, along with hints for generating maximum realism. It's all explained in the set of instructions that comes with your Quick-Rate package. Bottom line: if you've got a shoe box full of baseball cards laying around in your attic or game room, here's an all-new, totally fun way to enjoy them! The basic HISTORY MAKER BASEBALL Trading Card Quick-Rate Package sells for $19 postage-paid and comes with a colorful mini-folder in which to store your Quick-Rate cards and instructions booklet (some assembly required). Or, get the "luxury box" package for just ten bucks more, and get the basic pacckage PLUS four unopened wax packs of authentic Topps 1980s baseball cards, so you can start playing right away! (Remember how much FUN it was, opening packs of baseball cards when you were a kid? It’s STILL fun, all these years later!) 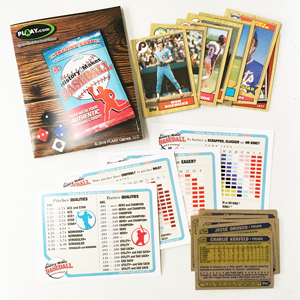 The "luxury box" package also includes colorful, standard baseball card-sized pitcher batting cards for use in your games, and a set of nine extended manager strategy cards designed especially for trading card play. (We used these special manager strategy cards in our PLAAY-Dot-CON trading card tournament!) Click HERE to see the contents of the "Luxury Box" package. BOTH editions of the Trading Card Quick-Rate package are NOW AVAILABLE! As always, if you have any questions, just let us know—we’re always happy to help!